I recently did a post on starting the Low GL diet and a couple of the books I bought for it, if you want to read that post it’s here and explains a bit about the ideas behind it. This is a bit of a different book review on that, as these two are so similar, I thought I’d do a bit of a comparison between them. 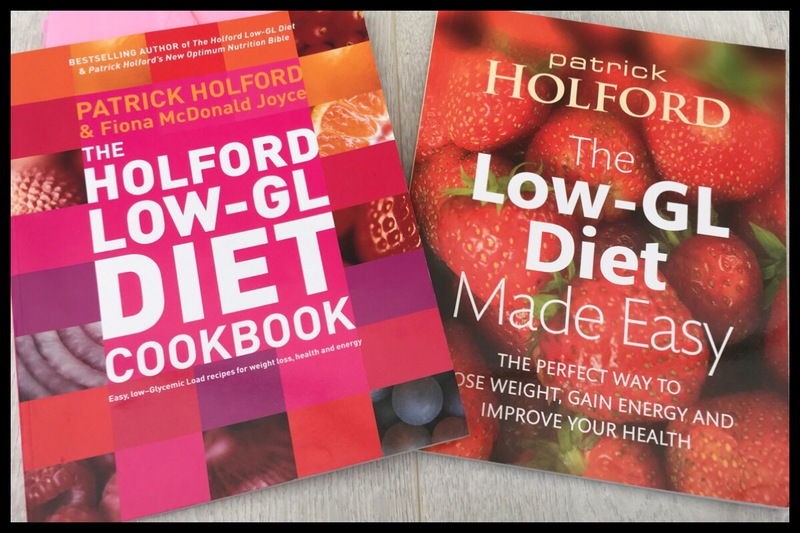 The two books are The Low-GL Diet Made Easy (Holford, P. 2006) (RRP £15.99) and The Low-GL Diet Cookbook (Holford, P. And McDonald Joyce, F., 2014) (RRP £12.99). I’ve included more information on each at the end if you want the ISBN number and publisher information. I think that both of these books are helpful if you’re considering the diet, even if you’re not the idea behind it is interesting and the proportions of different food types can be transferred into any diet really. If that is the case I’d say these books wouldn’t be necessary, there’s enough information on the internet about it that you could research a bit with that before choosing to spend money on a book. For diet books I think these both look nice, the bright colours definitely make them stand out on the bookshelf and they’re not an awkward size to fit into a standard bookshelf like some books are. Some look great but have to be kept lying down or on a completely different shelf. The fact they’re paperback means they’re less bulky and, I find anyway, that it makes it easier when it comes to using the recipes at the back of the book. As these aren’t the longest books around, 189 pages for the cookbook and 158 for the other, they’re fairly slim and are a pretty good size to stick in a larger bag if you want to read them on the move. Both of these books have large chunks written just by Patrick Holford and both have input from others, mainly the recipe sections for both. They are the same size, which is nice in that you can have the set and they all sit together well, and both printed on fairly glossy full colour paper. Both also have the same sort of format; an introduction to the diet, information in portion sizes and then the recipes. The main difference is the ratio between these two main parts; the Low-GL Diet Made Easy has a larger proportion of information to recipes and a smaller number of recipes, which makes sense given that the other is supposed to be a cookbook. I’ll start with the cookbook, which is the longer of the two and has 150 recipes in it. These take up over half of the book with 80 pages full of them. 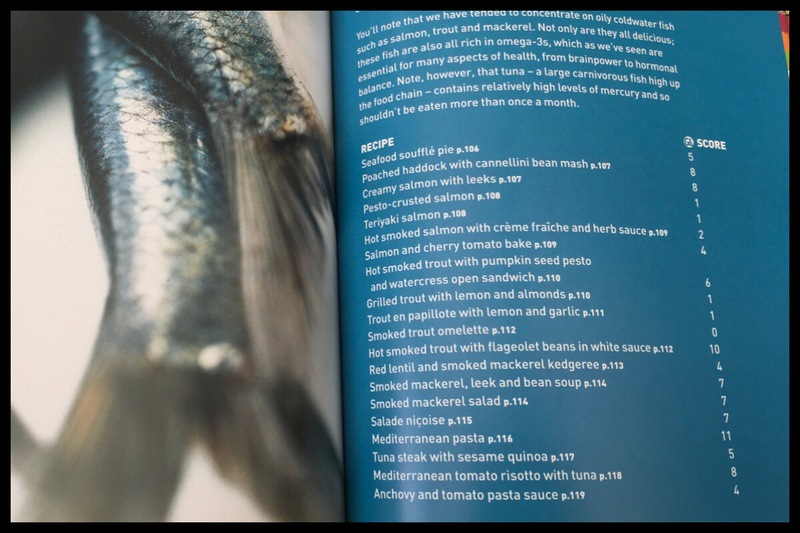 It isn’t the kind of cookbook you pick up and flick through to look at pictures, there are none apart from when it comes to the title page for each section, but I have enjoyed reading through them at times for ideas as well as actually trying the recipes. I haven’t tried many but a favourite already are the burgers, even with people not interested in the diet. There are sections on breakfast, snacks and starters, meat, fish and vegetarian main meals, accompaniments, sauces and dressings, and even some for sweet puddings and drinks so it covers pretty much any type of meal. The front section of the book, roughly 60 pages, includes information on the diet, portion sizes for a large range of different foods and even menus for both a weight loss and maintenance diet. 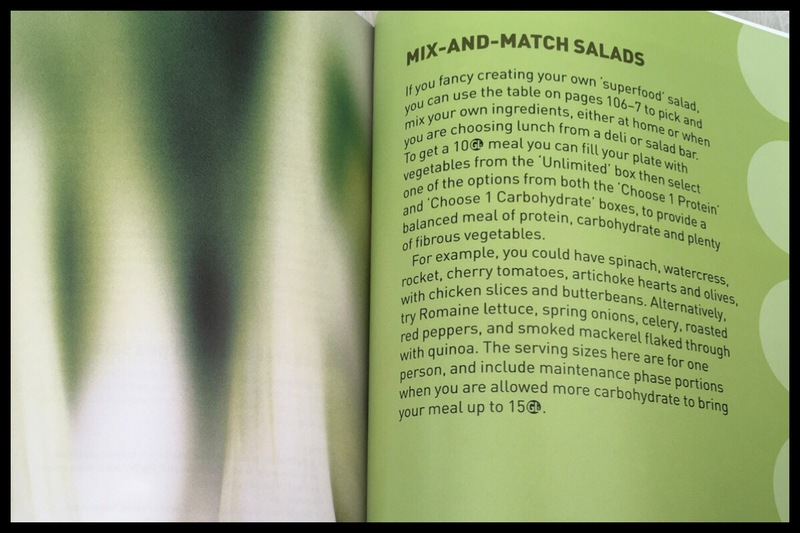 The Low-GL diet Made Easy follows pretty much the same format; bright glossy pages with colour codes when it comes to the recipe sections. There are the same tables in this, along with the same shopping list for ideas on what to have in the house to get started. This one does go into a lot more details, with a Q&A style section about what to expect from the diet and what if it does work how you’d want it to. This book has 88 pages in the first half, split into two parts, and less than 50 on the recipes, though it does also include a helpful section at the end which lists good and bad foods when eating out. One thing I like about this book, which it does have over the cookbook, is that within the recipe sections there are mix and match pages which tells you to pick a certain amount from one box, a certain amount from options in a second and the same for a third so it’s less rigid than the cookbook and does, as it says, make the diet seem easier if you’re not confident in making your own meals up out of the portion sizes given at the start of the book. The sections in this one are divided differently with breakfast, food on the move/working lunches (salads and sandwiches), main meals (meat and poultry, fish and vegetarian) and easy desserts. As you can see there’s a lot in the two books that’s exactly the same, the main difference is the amount of recipes as well as the kinds of meals covered in a large portion of them. I think there are only two or three recipes that are the same in both, one being porridge which is probably hard to change really, so you don’t really have the overlap in that area in having both. They’re both helpful and give you a good starting point, I’ve found that using the information in them I’ve been able to make my own meals that fit within the portion sizes and either book works for that. If you are interested in getting one of them, or both, I’d say think about the kind of foods you eat, whether it’s the more on the move and snack style foods that are more flexible or full meal recipes as that is the main difference besides the amount of recipes in there. If you want to give the diet a go I’d say that the recipe book actually has enough information on the diet without the need for the other, along with the larger amount of recipes and greater range I’d say this is the one I’d recommend over the Low-GL Diet Made Easy. If you do want to buy the books then definitely look on amazon, I found them second hand very cheap (some starting from £0.01 plus p&p) and both of mine are in good condition. I’d also say these are the kind of books that would survive well, mine have had things spilled on them already, so there’s less of a worry of missing pages and the binding going unless they’ve been mistreated or there haste been a major accident with it (falling in the sink comes to mind after past experience with cookbooks! ).